The hazy peaks of the Chisos Mountains in the center of Big Bend National Park first come into view once through the northern entrance along US 385 at Persimmon Gap - the one breach in the high Santiago Mountains that form a natural barrier across the desert. 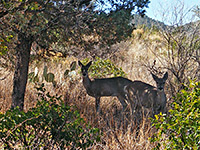 A ranger station, visitor center and picnic area are located next to the road in the Santiago mountain foothills, still high enough to overlook several miles of the highway to the south, as it crosses a wide desert plain flanked by distant hills, past three main points of interest. First is the trailhead for the easy 2 mile walk to the deep ravine of Dog Canyon, and the more strenuous but also more interesting 3 mile hike to Devil's Den, a narrow vertical-walled limestone gorge. 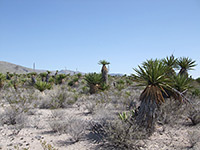 Ten miles south, the road reaches the turn-off for the Dagger Flat Auto Trail, a 7 mile gravel track leading to a grove of giant yucca plants. Although maintained and generally suitable for all vehicles except large RVs, this route is narrow, bumpy and steep in places, so care is needed when driving. The road crosses bushy flats for a few miles then climbs through a range of low hills, descending the far side and veering to the north, alongside a dry wash to the wide valley containing a forest of yucca faxoniana, the giant dagger yucca. The third location is the Grapevine Hills, a colorful region of eroded rocks and mud dunes which can be visited by walking cross country from US 385, though the usual approach is via a separate track branching north off TX 118 (see park map). US 385 ends at Panther Junction, site of the park headquarters, a visitor center, post office and gas station. A left turn along TX 118 eventually reaches Boquillas Canyon in the southeast, while the road to the right (also TX 118) leads past the Chisos Mountains and on to the more-visited southwestern section of the park; another junction soon after is with the road into the mountains. 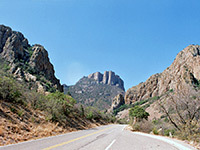 The road into the Chisos Mountains is 6 miles long, quite steep at one point and with some hairpin bends that reduce speeds to 15 mph and make the route not recommended for vehicles over 24 feet long. 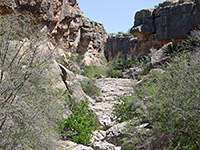 The vegetation changes markedly over a short distance - from cacti and other Chihuahuan Desert plants through a transition zone with bushes and grassland, to fir and pine woodland at the upper elevations. From a highpoint of 5,679 feet at Panther Pass the road descends a little into the sheltered Chisos Basin which has quite extensive development including a lodge (offering free wi-fi), shops, restaurants and a campsite; this is generally the most popular location to visit and camp in the park as other areas tend to be very hot for much of the year. Indeed many people seem to come here just for the facilities rather than hike the trails further into the mountains, or explore the lower elevation regions of the park. Chisos Basin is circled by high volcanic peaks and vertical, weathered cliffs, the one exception being due west where the desert is visible through a V-shaped gap known as The Window - orientated just right to watch the sun set below the horizon. A short loop path leads to a good vantage point and a 2.2 mile trail follows the valley (Oak Creek Canyon) to the window itself, from where much more of the lands to the west can be seen. Apart from the various facilities and services, hiking is the main reason to visit the Chisos Mountains - a variety of long foot paths cross the hills and valleys, mostly south of the basin. Besides the Window Trail, the other popular half day trip is the Lost Mine Trail which climbs to a high ridge overlooking the desert to the southeast. The majority of the other options require an overnight stay in a primitive campsite, or a more strenuous all day hike. 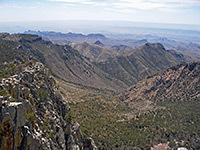 They include a climb up Emory Peak, the highest summit in Big Bend National Park (4.5 miles one way, elevation gain 2,450 feet), or the South Rim Trail (several routes, with a round trip of at least 14 miles). 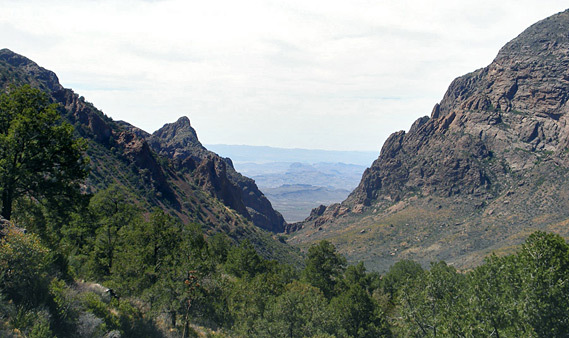 Descriptions of all trails in the Chisos Mountains. Emory Peak and Chisos Mountains topographic map.